TS Bank Employees bring Christmas to Children's Square U.S.A.
Council Bluffs, Iowa - Dec. 13, 2017 - TS Bank employees celebrated Christmas with the boys and girls at Children’s Square U.S.A. located in Council Bluffs, Tuesday, Dec. 12, 2017. 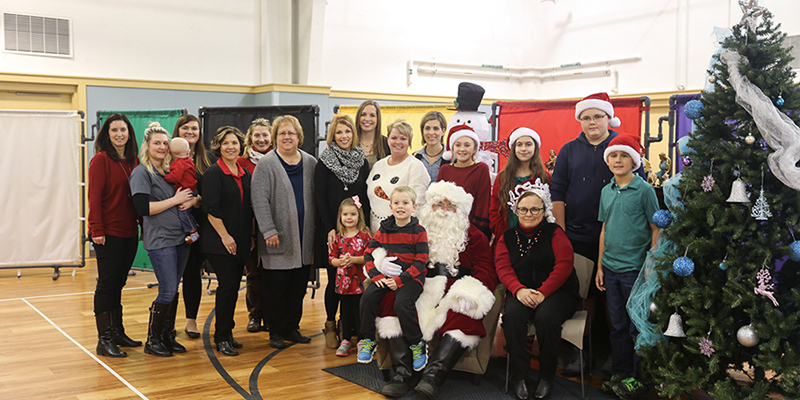 TS Bank employees sponsored one or more Children’s Square residents, bought individual gifts from their wish list, and held a Christmas Celebration, where Santa handed out a gift for each child. TS Bank employees Brian Pierce, SVP of Personal and Business Banking, and Jacque Jerkovich, IT Technical Services Manager, served as Santa and Mrs. Claus while elves, other TS Bank employees, handed out gifts. Group gifts for each cottage were also included in the donation, which included movies, board games and treats. TS Bank employees raised all funds for the gifts. Children’s Square is an emergency shelter for displaced children - usually temporary - until placement into foster care. TS Bank began this event the year after CEO, Josh Guttau and his wife, Shelly, adopted their oldest daughter from Children’s Square. “Love is not divisible, nor additive, but instead is multiplicative.” Said Josh Guttau, TS Banking Group CEO. Each year, the Guttau's encourage TS Bank employees to spread the word about the increasing need for foster care and considering giving the gift of a home to the kids at Children’s Square and other shelters. Through this process they learn more about what Children’s Square does and the immense need for local foster care. This event has been a favorite amongst employees and a great highlight of how TS Bank reinvests and impacts its local community and youth. Additionally, over the last three years TS Bank had a part in Children’s Square’s $9 million goal during their Better Spaces, Brighter Futures Capital Campaign, a campaign to raise funds to build a residential treatment complex to replace three outdated cottages and to fully renovate a dormitory built in 1913. The current complex houses grades 1 – 12 with behavioral and emotional needs requiring special educational services. Although each of the current facilities have been remodeled over the years, they simply were not built with the safety, supervision and security considerations needed for today’s specialized care, education and treatment needs. Children’s Square is a 135-year-old non-profit with a mission to teach life skills and values necessary for success. They empower all to have the vision to see, courage to try, and will to succeed, providing care, education and treatment for over 1,400 kids and families a day in Western Iowa and the Council Bluffs/Omaha area. TS Bank continues to be an annual sponsor along with supporting the spiritual life program, and received a Jason Award in 2016 for its efforts. Since 2014, TS Bank has donated nearly $20,000 to Children’s Square in addition to hosting the Christmas celebration with employees, now in its sixth consecutive year. To learn more about Children’s Square visit http://childrenssquare.org.